Chris Gourlay at the TimesOnline has an story about people raising cows [^]in their back garden. This apparently is all down to an Irish breed of dwarf cow, the Dexter, that can product 16 pints of milk a day and a calf each year. Now that is one way of beating increasing food costs. Apparently the Dexter comes in around the about the same size as a large German shepherd and are billed as being “the world’s most efficient, cutest and tastiest cows”. 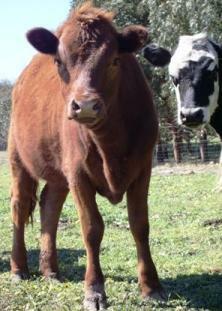 Brown Calf - Are You Looking at Me? What more can anyone ask for pet and food factory all rolled into one! And there is another benefit, life all cows they eat grass so they can mow the lawn as well. Not to be outdone there are also Mini Hereford [^], and Lowline Angus [^]cows coming in as backyard cows. The Lowline Angus was developed by the Australian Government and are just over a metre tall, and weighs in at around 300kgs – that’s a whole lot of steaks, and schntzel, and sausages . . .
is the back garden big enough? is who is going to go out on poo-patrol? could you eat the calf above after having it as a pet?